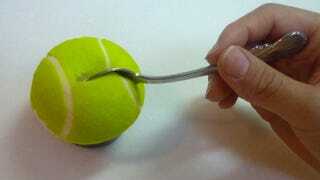 If you said, tennis balls look cute, I could see that. They're green and fuzzy, and that's cute, I guess. But delicious looking? Tokyo sweet shop Nikki Cafe is serving (GEDDIT?) tennis ball shaped cakes called, um, "Tennis Ball Cakes" for ¥450 (US$5.80) apiece. They not only look realistic, they also look yummy.